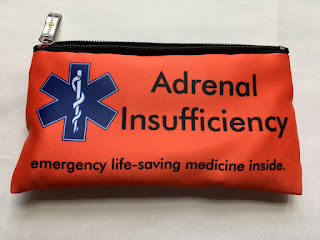 After a BLA, you are given prescriptions not only for your daily steroids (cortef and florinef), but also an emergency injection kit in case of emergency. This is no ordinary pen style injection. As you can see in the photos below, you have to mix it yourself, pop the top off, then draw it up, then finally, inject it. Not the easiest thing to do when you are in a questionable state. Now, I mostly keep it in my car, in my purse. If I am going somewhere for the day, I will take it with me, and I always had it with me at work, but when I'm running into stores, or to a friend's house, I rarely take it in with me, knowing it's just a few feet away is enough.